In some ways, summer trousers are more challenging than jackets in terms of cloth, and therefore more interesting. Trousers present the challenge of having something cool, but with enough body or crispness to hang straight. Jackets are less restrictive, for while it’s still useful to have some body (and drape) to the material, a sharp crease is not required. And – just as importantly – there is more structure in the pad and canvas to support that cloth. It’s probably worth reading our previous installment in this series, therefore – the guide to Summer Trouser Cloths – before reading this one. But on to summer jackets. 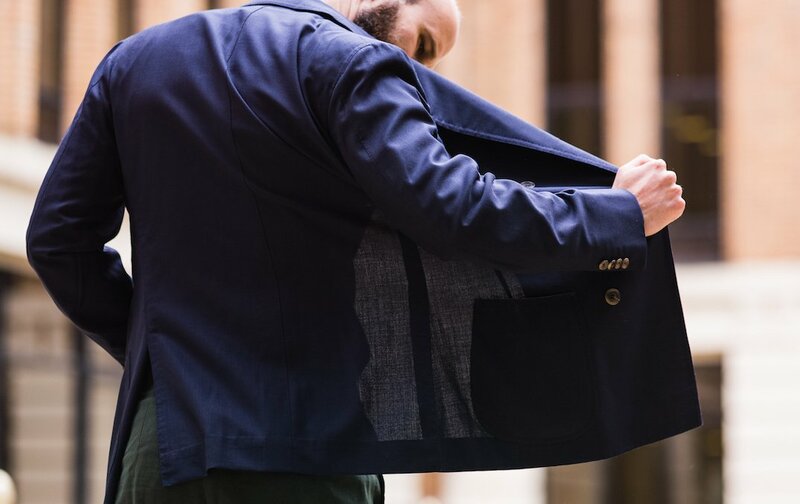 The options for a summer jacket are broadly the same as with trousers: linen, cotton, wools that are particular for their weave or yarn, and mixes. Let’s start with wool, for if a summer jacket can be made to work in wool, it has many knock-on benefits (resistance to wrinkling, recovery from wear etc). Generally, a lightweight wool will be made more breathable and therefore cooler by using an open weave. It’s hard to have an open weave with summer trousers, because a loose wave loses its shape much more easily. They can be a nightmare to cut, in particular, and can suffer from seam slippage. But in a jacket, an open weave works well. A high-twist yarn also goes some way to mitigate the looseness of the weave. The classic weave style for a summer wool jacket is hopsack. Hopsack, of course, is the name of the weave and nothing else – so hopsacks may vary hugely in terms of the yarn they use (weight, twist), the closeness of the weave and so on. But in general, a hopsack or hopsack-like weave will work well for a summer jacket. The weave style is essentially an enlarged plain weave, and other versions of a plain weave can also work. (A plain weave is better than, say, a twill because it uses less wool per inch and is therefore lighter. See our post on Weaves and Designs for more detail. From a style point of view, it’s also important to note that you generally want some texture in the jacket, to separate it from the trousers and remove any suggestion that it is one half of a suit. Linen is perhaps the ultimate summer jacketing material in terms of coolness. It is cool to the touch, breathes well, and has an elegant rumple to it. However, that rumpling is the thing that can put some people off – either because it is too informal, or because they plain don’t like it. One difference to note between jackets and trousers is that is is easier to get away with lightweight linens in a jacket. So you can more easily opt for 8 or 9-ounce linens, and those with a looser weave. Where their softness might make a trouser rather shapeless, a jacket is less restricted and has the support of pad and canvas. Cotton, despite its lack of stretch, can be an effective and modern option for a summer jacket. Cottons used for tailoring are light and cool, and where they can wrinkle unattractively in a trouser, this is less of an issue in a jacket. It can be a ‘modern’ option because of the way cotton ages, often losing colour at the edges and other wear points, and making it look lived-in very quickly. 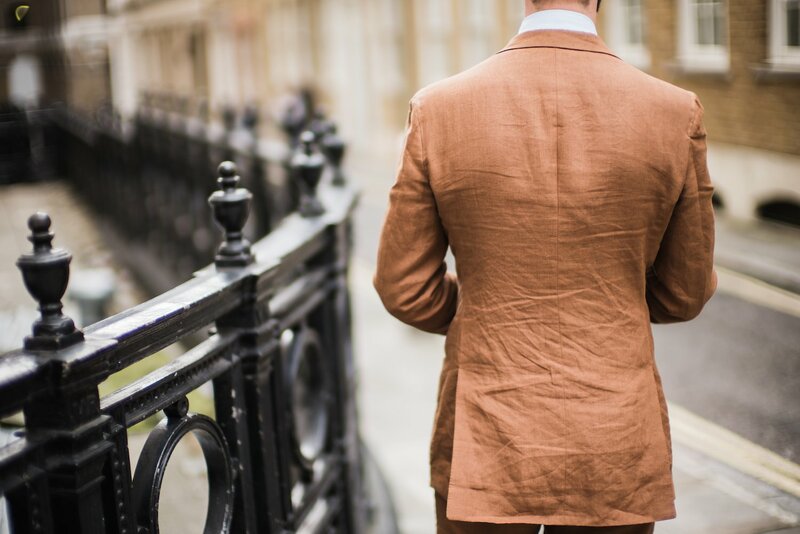 Darker colours will show this effect quicker than light ones, and garment-dyed jackets (eg Boglioli) are often specifically created to have the effect from day one. Last, and for my money best, is a wool/linen/silk mix. This type of cloth has been offered for decades by the Italian merchants like Drapers and Caccioppoli, but only began to appear in the UK in the past 5-8 years. The advantage of using three different fibres, in a variety of yarns and weaves, is that a precise and targeted effect can be achieved: the exact amount of lightness, body, and texture. So a jacketing in a wool/linen/silk mix tends to hang better than a pure linen, have more texture than a pure wool, and look smarter than a pure cotton. The silk can add lustre or shine if desired, and the linen more or less slubbiness to the texture – for something a touch more casual, than blurs the different colours, and that obviously separates it from the trousers. The only technical note here is that readers shouldn’t pay too much attention to the proportions of all three fibres in the cloth. Although that is important, the actual effect can heavily depend on the type of weave, the yarn count and the weave. Two cloths might have 50% and 15% silk respectively, but the latter appear more silky and shiny, for example. Instead, feel the cloth and consider how stiff or soft it is (stiffer cloths will tend to hang more cleanly) and look at the texture and consider how rough or smooth it is (and therefore broadly, how casual or formal). You can follow the discussion on The guide to summer jacket cloths by entering your email address in the box below. You will then receive an email every time a new comment is added. These will also contain a link to a page where you can stop the alerts, and remove all of your related data from the site. I’ve missed some interesting cloths in your post: What about the 100% Bamboo that HFW offers? I’ve seen some wool and linen cloths that are worth considering, their lack of silk make them more subtle than the usual wool, silk and linen mixes. What’s your opinion on them? I’ve never been much of a fan of bamboo, but you’re right I should include it and give my reasons. I have several bamboo jackets. Light, cool, crease resistant, interesting textures. thank you for the quick overlook. I was wondering what cloth you would recommend to you use for business summer suits? I’am working in commercial real estate and have to follow a certain dress code so no combinations, loud colors or textures allowed. Try high-twist wools, such as fresco and crispaire. Also, have a read of our guide to suitings (worsted). There is a link next to the top of this post. How do they differ and which would you recommend and why? Any comments on hemp? Similar to linen I suppose? Delfino have some bunches 100% and mixes. Just something I noticed on the jackets from Anglo-Italian. What’s that stitching on the buttonhole? I am not fan of the cotton jackets. In the summer, people sweat more than usual and cotton tends to start smelling very fast. Shirts can be washed after each wear, but for jackets this would be unpractical. And this makes me very sceptical regarding cotton jackets. Wool on the other side could be aired during the night and would not smell. Dear Simon, In your interview of Richard Anderson you discussed frequency and disadvantages of chemical dry cleaning, which I guess is inexpensive in UK. Hristo judges washing smelly cotton jackets unpractical, but doesn’t explain. Do you take for granted cotton jackets can be washed? 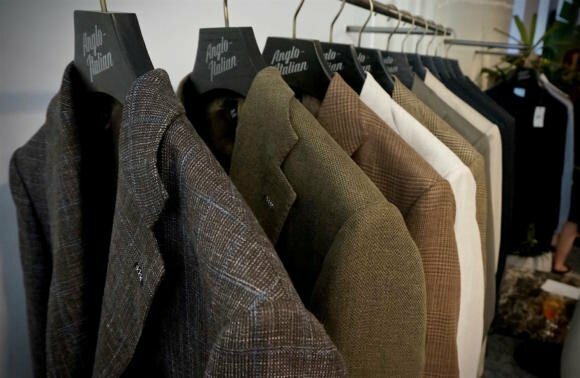 Are your bespoke cotton jackets washable? The only RTL cotton jackets I’ve seen which are washable are ugly ones by Brook Taverner and one Gurteen model. Were cotton Gurteen on closer inspection a bad investment? No, they aren’t washable, I clean them as I do normal wool suits. I value your endorsement of cotton although you have the best clothes beyond my present reach. Since I don’t have a cotton jacket (besides Gurteen washable, I have my eye on Oliver Brown and Regent Tailoring), disco dancing is sweaty, not necessarily smelly. My nose is hybrid canine. Online viewing ain’t the same as first-hand inspection. Linen creases, cotton may be the answer. what’s your opinion about mixed fabrics? In particular I refer to the Holland and Sherry wool/teclana mixes from their summer variety bunch. If it’s mixed with synthetics, I’m generally not a fan. Hi Simon, how tailored should a summer jacket be? In general should a jacket be taken in at the sides a little if necessary or because it’s informal can it be worn less tailored? 1. Any experience with heat-resistant finishes like those Zegna claims for their Cool Effect and Elements Trofeo Summer wools? I’ve never worn them outside but am skeptical that they’re cooler than the silk/linen/wool mixes. Zegna also makes fully lined jackets with them, seemingly defeating their purpose. 2. For me, once it gets above 80 F (~25 C), wearing a jacket outdoors becomes totally uncomfortable no matter its material. This whole summer suiting business is perpetuating a culture of stiff upper lipping serious back sweat and body odor to all of our detriments. 1. No, sorry, but with the lining bear in mind that a lining can mean the jacket is easier to get on, hang more cleanly etc. So you could possibly get those benefits while not being as hot as with another lined jacket. 2. I know what you mean, but I find a jacket is fine – the more important things are something to shade the head and having air circulating around points like the neck and ankles. And light, comfortable shoes. I have had a zegna trofeo wool suit years ago and never had a better suit for hot summer days since. It was lined. thank you for this article which confirms my choice for summer time. I was two cotton suits, one DB one 3 piece SB, Bothe light colors. Then 2 linen jackets ti wear wig odd trousers. Also I love to wear ma wool suit made from Zegna Tropical wth is very cool even on hot summer days. Looking forward to your next story on Napoli artisans. PS Going to Tuscany this week and maybe try to visit the P Johnson factory in Carrara to find out some details. Always interesting to read your view on such a topic! 1) What is your take on the différences between classic hopsack & mesh, in terms of wearability, versatility, etc. 2) Since I still struggle to find out the right fabric – other than cotton – that would go with linen jackets, I would greatly appreciate if you could be more specific as to the kind of wool, say, one should be considering, or rather anything that could upgrade an outfit with a linen jacket as a key piece. 1) Hopsack itself varies a lot, and mesh doesn’t necessarily refer to a specific weave etc. But, that aside, mesh tends to have more texture and therefore be more casual. What about Solaro? I never saw any but I believe it is for summer jackets (or suits?). More for suits. It is sometimes worn as a jacket, but I wouldn’t recommend it. You could also look at H&S Mesh as a great cloth for a summer blazer. As seen on my Ettore de Cesare blazer recently on PS…. What colors would you recommend for a summer jacket? It depends on how and where you want to wear it – for example, for business or leisure, formal or not. Thanks for the link. No, I’m not new here, but I’m looking for a versatile, I guess smart casual, jacket. I already have a navy one made of a cotton linen mix, and have been looking at gray linen but for some reason I haven’t been able to find one that looked right. Could it be gray linen doesn’t work? Then what would besides tan? Cream is too flashy. Would you recommend a muted green? Just one last thing, do you also find gray doesn’t quite work with the texture of a linen jacket? If you mean grey as the colour of the jacket, then yes i do, it’s not a great colour generally. For trousers, no I think grey can work well. Yet didn’t you have one made by Caliendo? Was that because it looks almost oatmeal in color as opposed to a blue tinged gray? I just don’t get this gray and green thing. Never seen it in warmer countries. Sipping my aperitivo in Florence last evening wearing pink linen, white shirt, navy chinos and brown suede loafers there was no sighting of either color. Where does the idea come from? For most people in most parts of the world, that colour combination would be rather too strong. And then attempting to mix up versions of both. If only we were all having drinks in Florence in the summer. Too strong? Pink, white and blue? Last night it was baby blue seersucker, navy linen shirt and blue suede driving shoes. Blended perfectly with the crowd. You would look out of place in gray and green here. can you compare pure linen with a wool mix purely in terms of heat resistance? Which one would provide better comfort during highest heat waves? Summers are getting worse every year. Thank you for an answer. It will depend on a lot of things, not just the fibre – the yarn, the weave, the weight. That’s what makes comparisons in cloths so hard. But all else being equal, linen is likely to be more comfortable in high heat. If you were to choose a colour for a linen jacket to go with jeans or chinos, what colour would it be? Thanks. Would you say 10.5oz is too light for a linen jacket? Also, the WBill Phoenix bunch is advertised as worsted but looks more like jacketing. Have you any experience with this bunch? Is it a jacketing bunch? One final question, do you get your linen jackets lined or unlined? I’m guessing lining would add more body but negate the cooling effects of linen. The colour thing is interesting. Pinks, blues, yellows, aquas etc work perfectly in the med/Adriatic/Aegean but less so in Brighton and Skegness, where the muddy grey/brown/green would look ok.
Don’t wear the muddy colours in the south, and beware of the pastel colours in the north, as both will look out of place. What’s your view on navy linen jacket with jeans? The jeans would be slightly lighter from washing but not have a tatty look. Perhaps a herringbone instead of plain. I am aware that this is an older article, but I have discovered your site only several weeks ago and you have so many interesting articles that it takes some time to catch up. I have recently ordered a classical 360g (12.7 oz) mid-grey single breasted suit from a tailor (it is my first tailored suit). I was wondering whether I should not order a waistcoat that I could wear during the summer time at work (without the jacket) and of course also during winter with the jacket. Do you think this would be a good alternative to a summer suit? Simon how can you wear a linen jacket? Ive consulted my style bibles by Boyer, Flusser and not much information on the subject. Obviously you can wear a linen suit, but what trousers to combine with? Any rules to keep to? If you went cream linen jacket, can you pair with a slightly different shade of trouser? Or even Chinos? Also, I heard someone mention a linen dinner jacket. Is this even a thing? Have a search around the site, Anand, you’ll find plenty of examples of me wearing one. Simon, you state cotton doesn’t stretch. The profis at Cutter & Tailor among others got annoyed when I wrote about my idea to add stretch. They insisted cotton does stretch. What do you think about cotton plus stretch 2% versus 100% cotton ? Cotton does stretch a little, but not as much as wool – that’s the most useful comparison in menswear usually. A very small amount of stretch in cotton trousers can be ok, but I generally avoid it. so your experience and judgment encourages me. Hi Simon, I’m looking at a nice grey summer sports jacket from SEH Kelly – a high twist, two ply worsted tropical / summer wool, open hopsack weave (they report that you can “see the light” through it). Sleeves are lined, and the rest is half-lined I believe (buggy-lined, they call it.) Does this fit the bill in your book in terms of wearability in a summer jacket made of wool? It’s not a blend. The texture will distinguish it from being mistaken for an odd suit jacket. The grey colour mightn’t be as versatile as navy, but, I have navy, grey, beige, cream and tan trousers, so I think that side of it should be ok. I think that sounds nice David, except that I wouldn’t normally say a high-twist wool has enough texture to be an odd jacket. You should be OK, however, given the casual styling of the SEH Kelly pieces. Hi Michael. Thanks, though that last suggestion is a bit too commercial for us – I don’t like those affiliate or kickback systems. As a reader you don’t know what the writers commercial relationship is. Any thoughts or tips on 100% silk blazer with a searsucker effect? Too lightweight to hang properly? If one wants a cloth with silk but that does not shine too much, what kind of weave and yarn is best? For instance H&S Crystal Spring bunch has a solid brown natté with 25% silk, but I find it very shiny (and stiff) at odds with the casual weave. I am about to commission my first summer sport jacket and thought this fabric (link below) was interesting. I was wondering if you thought it was too loud/busy for a first sport jacket and if I would be better off with a more muted grey or brown. Also, is “PA” polyester or nylon? When having jackets made up in linen, do you have the sleeves and shoulders lined? How much of a difference do you think I’d see in wrinkling? Any thoughts on what would be good for a first summer jacket? You would see rather more wrinkling in the linen mix, though not as much as pure linen. Thanks, Simon. I appreciate the advice. I generally like to wear a black t-shirt under my blazers, but occasionally I’ll wear a dress shirt, too. In that case, do you think the navy windowpane linked above would still work okay? I’ve read in your writings (don’t recall which piece) that you’re generally not a fan of windowpanes, but I suppose the Fox navy windowpane is quite subtle. I’ll likely get it with patch pockets, unlined, unpadded shoulders for a more casual look. Would love your thoughts. Thank you, as always. As you’ve built up these guides, you seem to have ordered Summer Jackets (this article) before Summer Trousers in your table of contents for the series. However, at the top of this article, you refer us to read Summer Trousers before this one. Perhaps you should switch the order to have Summer Trousers first in the table of contents, and then Summer Jackets afterwards? I am really torn here. I bought some beautiful worsted light beige 130s wool and cashmere fabric, fairly lightweight 9 – 10 oz., but only enough to make a jacket (2.3m). I thought about buying enough to make a full suit but really think it is unlikely that I will ever wear a light coloured suit here where I live…and I mean ever. So the idea was to make an odd jacket, but will it look too much like an orphaned jacket. In which case are there some different styles I could experiment with to make a casual jacket from it? Any ideas to salvage this beautiful material? Thank you. Good idea. Perhaps pair it with cream cotton chinos….? I’m thinking of having the below cloth made up into a Neapolitan jacket. Do you think it would go with Crispaire trousers or something similar (fresco)? My concern is that the textures may be too similar. My concern is that it may look like I’ve mixed two suits. Thanks for the speedy response. I already have a mid grey pair of Crispaire, so there’s enough contrast. I guess the alternative would be a 100% linen jacket to go with the Crispaires. Thoughts? That would be less likely to have an issue, yes. As always thanks for your help. I guess if I’m going with this cloth and Crispaire, rather than texture, contrast will be key. Thank you very much for your inputs. I have discussed this issue of weight and breathability today with two of the tailors who make my bespoke suits here in Rio de Janeiro. They are not aware of the fresco fabrics, but recommended a lightweight 210g by Drago (Blue Feel collection, I think Super 140), which I am not familiar with. During a quick observation of the sample (mid to dark navy), the weave seemed rather open and breathable, as I was able to easily look through and see the other side. Since I request my suits to be unlined or half-lined and use each one of them once a week (sometimes twice), it would seem that this Drago could be a good option, but I am not sure about the wrinkling issue. A 210g would rather get wrinkled very fast, don’t you think? As I am a lawyer in an upscale traditional office, the jacket of the suit must also have a traditional look, preferably with minimum wrinkling. To find a middle ground on this topic is really difficult to me, and I do need to get a break from the Rio summer weather. Today we had 41ºC (107ºF), high humidity and barely any wind, and this will go on for 3 more moths, at least. Wow, that doesn’t sound very pleasant. Earlier this year I ordered a half-lined, Super 90 dark brown Dormeuil, which has this coarse touch and, even if it creases a bit, it comes back to normal within a few hours on the hanger (haven’t even had it pressed since I got it back in August). Unfortunately, since the fabric was already on the tailor’s shelf for some years (bought by the master tailor, his father, who sadly passed away), he could not tell me the exact properties of the cloth, though it is definitely old Dormeuil wool. I even sent an e-mail to Dormeuil with pictures of the cloth strip, requesting some info, but got no response, so unfortunately I could not learn much after some months of wearing the suit. I – Could you kindly clarify if this “see through” quality means that the cloth is breathable, thus advisable for a summer like Rio’s? II – If not, how can I tell that a cloth is porous enough to let the breeze go through it? III – If so, I gather I should look for this “see through” cloth, and additionally a high twist yarn, and maybe a bit heavier than 210g, so maybe 240-270g? IV – Also, I am not sure how to tell if the yarn has been highly twisted. If the touch is slightly coarse as you said, does it mean it is a high twist? V – Finally, since it is very humid here in Rio, will a coarse wool help by absorbing the sweat? Maybe a wool and mohair blend would be beneficial in my case? Apologies Simon for so many questions, a bespoke suit in Brazil is quite an investment. And although I am very pleased with the cut and style of my tailors, they do not seem to have much info on the technicalities of the fabrics they receive (like if the cloth is a high twist), only the grammature which is available inside those sample books. IV – You can’t really tell, but that coarseness is often a good sign. The tailor should know really. V – I’d avoid mohair and stick to pure wool. And yes wool will help, though the coarseness isn’t related to it. Thank you as always for the prompt response, Simon. I will try to find a suit based on those guidelines (100% wool, 270-320g, high twist, and loose weave that enables me to see through it). Fortunately my tailor has a large variety of sample books by most of the major brands you cite in your articles. Also, he told me he would try to gather some information with his suppliers about fresco. Should he succeed, would you rather recommend the fresco or should I keep with the “normal” wool? If the fresco, does the recommendation above remains the same, or should I watch for other qualities, like an even heavier cloth? I am reaching out because I have a question and thought you might be able to help. I am working on building up a quality wardrobe now, and am looking for a nice, versatile cloth for a tan jacket (see example attached). Would you have a recommendation by any chance? I would be super grateful for a specific cloth name, or a hint regarding the right type and weight of the cloth. This article actually got me thinking about this little project, an I am looking for something concrete now. All the best for you and Permanent Style! The image you refer to is Tommaso Capozzoli of Sartoria Vestrucci, wearing a cotton suit. Cotton has advantages and disadvantages as a summer jacket, as set out above. But I like it – my recommendation would be Holland & Sherry’s lightweight cotton, examples (and specifics) of which you can see on my Elia Caliendo suit and Musella Dembech suit. 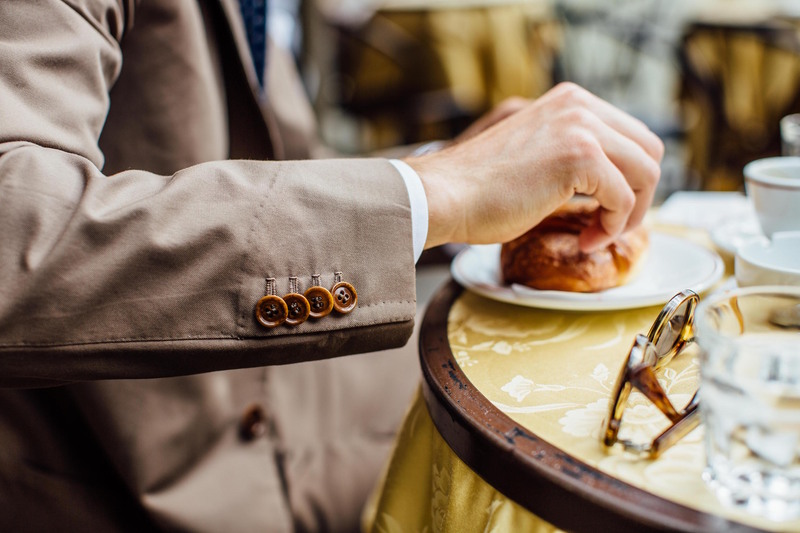 If you want a wool/silk/linen mix, which has the advantages set out above and is probably my go-to material for a summer jacket, have a look at the Caccioppoli and Drapers bunches. I don’t have any specific recommendations this season, but that’s the best place to look, followed by Loro Piana. In your opinion, is a 290g , 55% wool, 28% linen, 17% silk-Tom Ford Hopsack to heavy for a summer jacket? This would be worn in southern Italy in July/August. It is great looking, sturdy, but may be too heavy. I do appreciate your feedback. Hi Simon, perhaps a little late (posting in 2019 to a 2017 article) but I find the cloth in the header of the article just stunning. To my eyes it seems hopsack (please correct me if I am wrong) . Any idea as to the name of it? Thanks in adbvance and all the best! I am going to commission a spring/summer suit in fresco, crispaire or finmeresco at Saman Amel. I am thinking about whether I should have it lined or halflined. I think a lined jacket hangs better and have more pocket but wonder how much warmer it would be. Do you have some advice about the pros and cons of lined vs unlined jackets? Sounds very nice. If you’re concerned about heat – ie you want this to specifically be wearable in rather hot conditions – then I would go for half lined. So just unlined in the back, where most of the heat will escape. But don’t feel that just because it’s a spring/summer cloth that you have to have it unlined. Does that make sense?